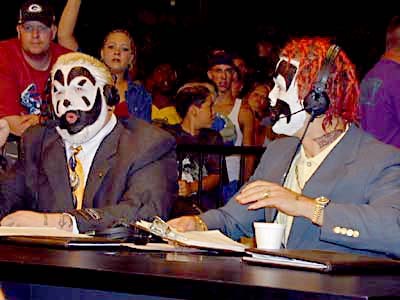 The Insane Clown Posse were part of the faction known as The Human Oddities..
October 5, 1998 – RAW: The Headbangers defeated The Insane Clown Posse (Shaggy 2 Dope & Violent J).. 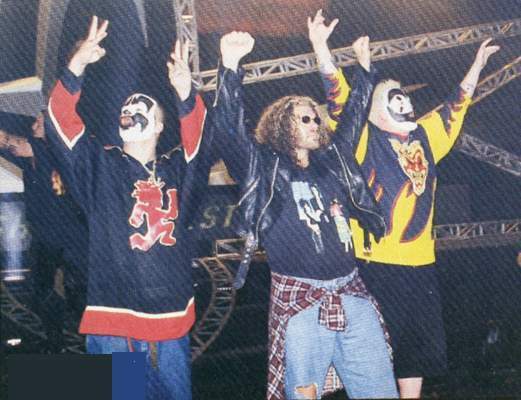 The Insane Clown Posse joined forces with Vampiro and Great Muta as the Dark Carnival..
August 9, 1999 – Nitro: Insane Clown Posse & Vampiro defeated Lash Leroux & Norman Smiley & Prince Iaukea..
August 16, 1999 – Nitro: Insane Clown Posse defeated Public Enemy (Rocco Rock & Johnny Grunge)..
August 23, 1999 – Nitro: The Filthy Animals (Konnan & Rey Mysterio Jr.) defeated Insane Clown Posse..
September 13, 1999 – Nitro: Insane Clown Posse (Shaggy 2 Dope & Violent J) defeated Lenny Lane & Lodi..
August 14, 1999 – Road Wild: Billy Kidman & Rey Mysterio Jr. & Eddie Guerrero beat Vampiro & Insane Clown Posse..
September 12, 1999 – Fall Brawl: Billy Kidman & Rey Mysterio & Eddie Guerrero beat Vampiro & Insane Clown Posse.. 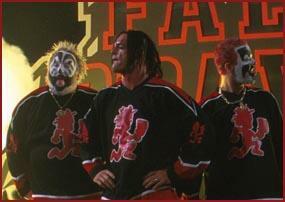 The ICP started their own wrestling promotion and disrespectfully named it Juggalo Championshit Wrestling..
March 17, 2000 – Mid American Wrestling: ICP make an appearance wrestling Big Flame, Neal, & Bob in a Handicap Match..
May 26, 2001 – XPW Redemption: Shaggy 2 Dope and Vampiro make their debut appearances in XPW and joined the Black Army..
~~~In the same night, Shaggy 2 Dope & Vampiro defeated Mexico’s Most Wanted (Damien 666 & Halloween)..
~~~On the next XPW show, Shaggy 2 Dope was joined by his partner Violent J..
Dec 15, 2001 – COD III: ICP was scheduled to appear but cancelled last minute, leading to Zandig cutting a “F*ck the Clowns!” promo..
January 21, 2004 – NWA^TNA: The ICP appear on TNA PPV as “invited guests” and went after Jeff Jarrett during the main event..
February 4, 2004 – NWA^TNA: The Insane Clown Posse defeated Glen Gilbertti & David Young..
February 18, 2004 – NWA^TNA: The Insane Clown Posse defeated Glen Gilbertti & Kid Kash in a “Juggalo Street Fight”..
December 13, 2004 – Night of Appreciation for Sabu: ICP & Rude Boy beat Corporal Robinson & Zach Gowen & Breyer Wellington..
March 17, 2006–TNA 1st-Ever House Show: Insane Clown Posse (Shaggy 2 Dope & Violent J) beat Petey Williams & Eric Young..
~~~Team PWU (The Backseat Boyz & Corporal Robinson) defeated Team JCW (2 Tuff Tony & Violent J & Dyson Pryce)..
August 12, 2007–JCW Bloodymania: Insane Clown Posse & Sabu defeated Trent Acid & The Young Alter Boys w/Annie Social. 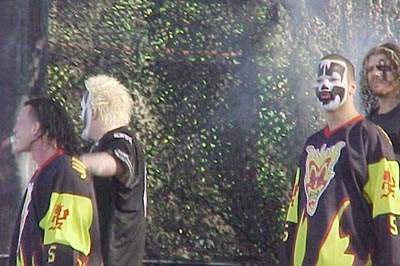 November 9, 2008 – TNA Turning Point: Scott Hall & The Insane Clown Posse were spotted sitting in the front row with TNA fans..
Madison Carter wrote: Before their WWF days, ICP did a few of their own shows (pre-Juggalo Championshit Wrestling as well), in which they wrestled in a number of identities. 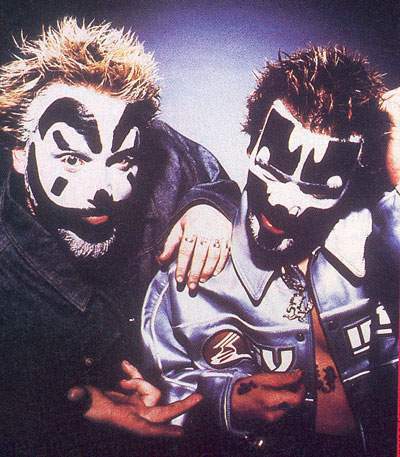 If you want, I can go through my archives and find a few pics and names for them (and seriously, bro, Doppleganger WAS Violent J).